With the decision to devalue CNY by 1.9% on Aug 11th, the Chinese authorities have sought to break the link of CNY with the USD ahead of the Fed’s tightening cycle and after large CNY real effective exchange rate appreciation was incurred over the past couple of years. We look for gradual depreciation of CNY vs. USD (3-5% by end-2015), as broad monetary conditions are too tight in China and debt deflation risks need to be tackled. In our base case scenario, fiscal and monetary support help stabilise the economy over the coming quarters, despite the long term drags from industrial overcapacity and housing sector imbalances. Among emerging market (EM) high yielders, MYR, ZAR and IDR seem the most exposed to recent developments in China given considerations on export mix and reliance on Chinese domestic demand. The renewed terms-of-trade shock, together with likely contagion from regional peers like CLP and PEN, suggests BRL may suffer from some negative spillovers too. At the other end of the spectrum, INR and TRY seem to be the most insulated given low trade integration with China and their commodity importer status. For broader currency markets, while the challenge for the BoJ and the ECB to raise inflation expectations is exacerbated, we do not look for the Fed outlook to be derailed as the impact from the tightening labour market and stronger economic momentum should dominate. China devalued CNY on Aug 11th, fixing the currency 1.86% weaker vs. the USD, the biggest single day depreciation since July 21st, 2005 when the PBOC initiated reforms towards a floating currency regime. This policy decision has been framed as an additional step towards a managed currency float, with the IMF SDR review providing the immediate trigger for the move. The IMF had noted the gap between the daily fixing and spot prices. The new mechanism for daily CNY fixing should ensure that market forces play a bigger role in the formation of price. Over the medium term, this argues for increased two-way risk for CNY vs. USD as emphasised by the PBOC. In the near term, CNY risks are biased to the downside vs. USD in our view, with the potential for another 3-5% by the end of the year, in our view. 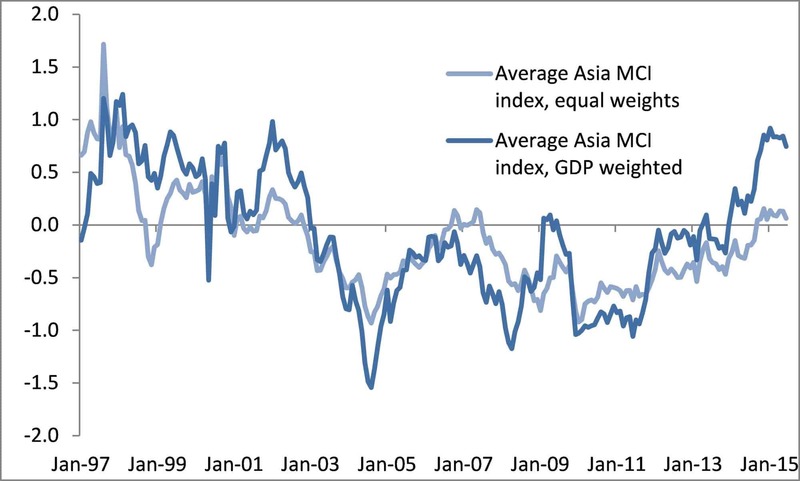 While the policy move marks further progress in structural reforms, a loosening of excessively tight broad monetary conditions also appears to be welcome in view of the cyclical weakness of the Chinese economy (see chart 4 in the appendix). 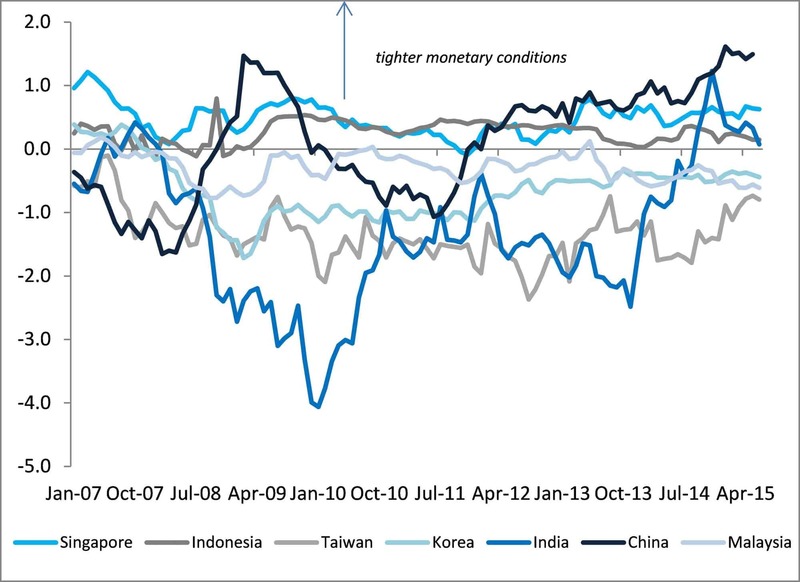 Our own monetary condition index (MCI), incorporating real policy rates based on current inflation and the real effective exchange rate, shows that conditions were the tightest in China across emerging Asia (see chart 2). Although most Asian economies also exhibit tight monetary conditions CNY’s link with the USD and deflationary pressures in China have exacerbated the situation for China (see chart 1). The very high private sector credit leverage of China (250% of GDP) makes it crucial that accommodative monetary conditions are achieved if debt de-leveraging is to remain an orderly process. We believe that monetary, credit easing and fiscal stimulus will continue to be used to alleviate deflationary tensions (see below the section on China’s economic outlook) to a much larger extent than currency depreciation. Hence we look for modest currency depreciation (3-5%) vs. USD rather than steep currency devaluation (20-30%) in the remainder of 2015. We do not believe that China primarily is seeking currency competitiveness with a large devaluation to revive exports for four main reasons. First, the weakness of global demand, especially from developed markets, is a key factor behind the weakness of Chinese exports rather than the exchange rate. Second, the authorities have put the rebalancing of the economy away from exports and investment to consumption as a key long-term priority. Third, large currency depreciation would risk to be destabilising. It would increase the pressure on Chinese corporates that have USD debt to repay and by intensifying expectations of further currency depreciation likely fuel increased capital outflows. As the BoP dynamics show (see chart 5), although China has maintained a large current account surplus over the past year (about 3% of GDP), FX reserves have fallen by USD 315 bn over the past 12 months. There is no doubt that this is still a very comfortable cushion of FX reserves (more than 4 times short-term external debt and 17 months of imports) that allows the PBOC to manage the currency. 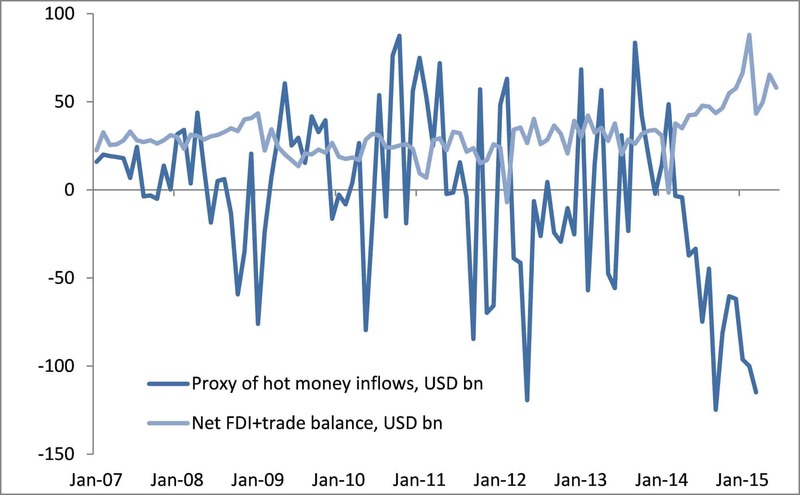 But a surge in hot money outflows – such as a massive unwind of CNY carry trades or portfolio outflows – could prove destabilising as they add to structural sources of capital outflows that already help recycle the current account surplus – including the accumulation of foreign assets by residents or corporate debt repayments. Fourth, while currency valuation metrics differ, the overall conclusion is that there is little evidence of significant CNY overvaluation. On one hand, PPP fair values continue to show large undervaluation of CNY vs. USD. Taking into account internal and external balances of the economy, fundamental equilibrium Exchange Rates models point to between 6.2 and 6.5 for USD/CNY equilibrium rate in Q3 2015 (FEER at USD/CNY 6.21 according to BoA ML or 6.54 according to GS). On the other hand, the 30% rise in the real effective exchange rate of CNY since 2008 (see chart 3) suggests CNY had become expensive on a historical basis. The Chinese economy remains in a transition phase, which entails restructuring of the economy, a housing sector downturn, and slower GDP growth. The latter will continue to be mitigated by policy support, mainly monetary and fiscal stimulus, to facilitate de-leveraging and preserve social stability. We look for a slow recovery in H2 2015 in China, after Q2 GDP picked up to 7% YoY. July economic data has been weak, including PMI, industrial production, investment and external trade, following signs of bottoming in May-June. Yet the impact from past monetary easing and removal of property curbs has been felt on the property sector over the past few months, with the pace of yearly decline in prices easing and a rebound in home sales. The drag from the real estate sector should be reduced over the near term, although the long-term adjustment will continue into 2016 given still elevated inventories. The long-term challenge for China is its political ability to manage slower GDP growth (5-6%) in order to reduce financial risks (excess credit leverage and housing imbalances). Although our base case is for an only modest decline in CNY over the coming months, even a modest depreciation is bound to have some spillovers at a global level and across emerging markets in particular. 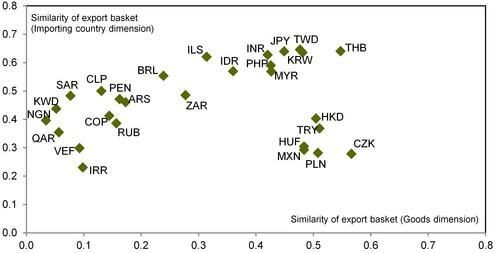 Based on a simple correlation analysis, a number of regional currencies look more ex-posed than others. As illustrated in chart 6 in the appendix, SGD, TWD and IDR have the highest correlation coefficients to CNY, suggesting greater sensitivity to further CNY weakness down the road. From a more fundamental perspective, this is largely reflective of trade integration and supply chain considerations. With China’s trade links with the rest of Asia having more than doubled in the past 20 years (China now accounts for over half of intraregional trade flows), vulnerabilities of regional currencies have also increased. As a matter of fact, some of the currencies with the highest sensitivity to CNY are among the top exporters to China as a result of increased integration in the regional manufacturing supply chain. Furthermore, countries like Korea, Taiwan and Malaysia display high openness and are to a large extent in direct competition with China based on the category of products they export and the countries that ultimately buy their goods. This heightens the vulnerability of respective currencies (charts 7 & 8). India on the other side of the spectrum strikes as having very limited commercial links with China. 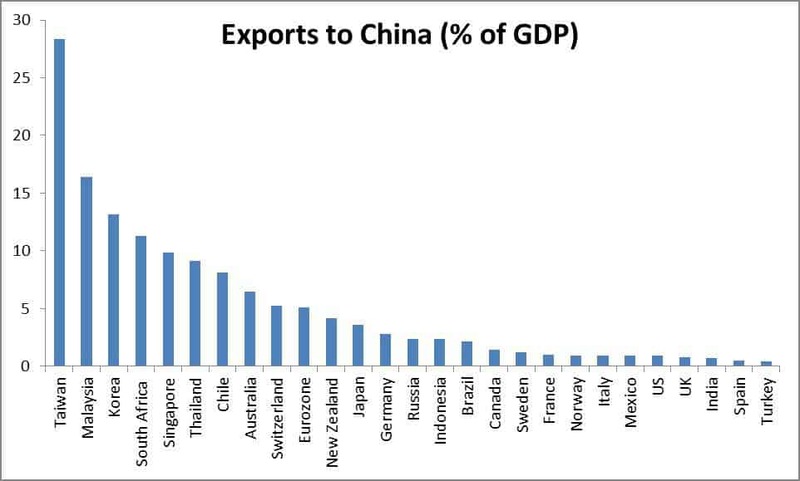 Similarly, while Turkey exports similar categories of goods to China, it does so to very different markets. Another channel affecting EM currencies is via the commodity axis. CNY depreciation could in fact lead to weaker demand for commodities, adding to bearish near-term price movement. 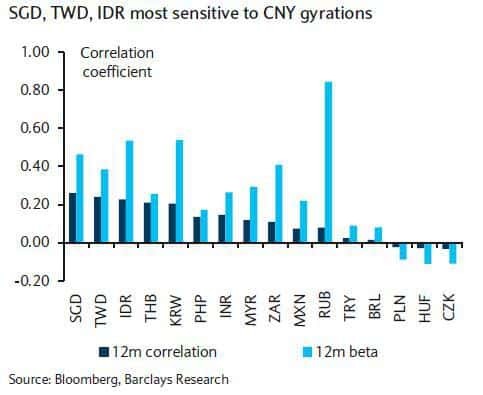 While we mentioned IDR has having a high correlation with CNY, MYR and ZAR more exposed from a fundamental point of view to the growth backdrop in China. 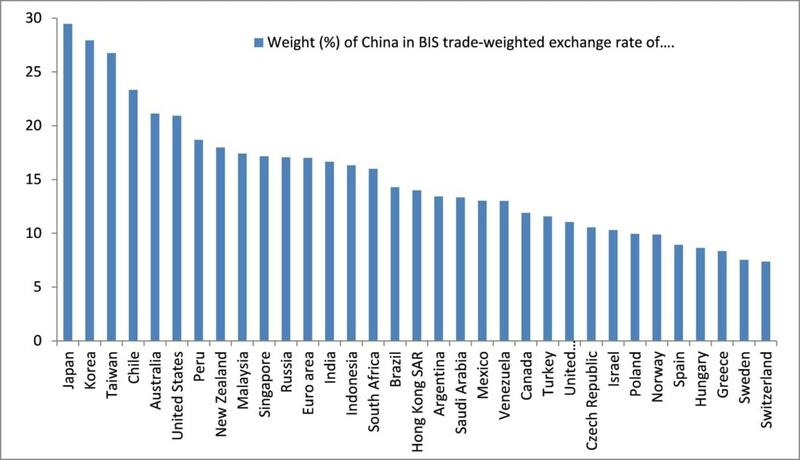 China is in fact a major destination for South Africa’s commodity exports as evidenced also by CNY’s high weight (about 16% – see chart 9) in the ZAR REER (real effective exchange rate) index, which is the highest among major currencies. 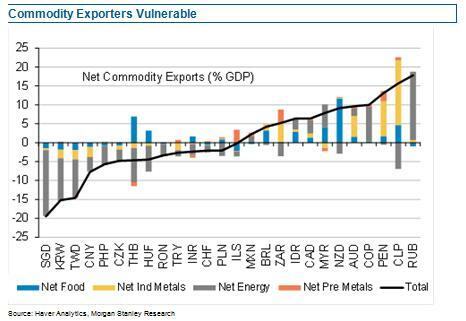 MYR’s mix of high exports to China and the commodity intensity of these have contributed to the recent underperformance as of late, which seems also warranted in light of pressures stemming from oil prices, a troubled political backdrop and a central bank unable to defend the currency. Similarly, albeit to a lesser extent, with CNY accounting for 20% of BRL’s REER, a challenging domestic backdrop may be compounded by a renewed terms of trade drag, adding to BRL’s woes. With 1% of GDP slowdown in China knocking off about 0.3% of regional GDP growth according to the IMF, regional currencies are also the ones most exposed to a further Chinese slowdown. Furthermore, with China making up for about half of global consumption in several key commodities, commodity currencies remain also on shaky grounds. Looking in more detail at a breakdown of net exports by commodity, as illustrated in chart 10, Latin American currencies are among the most exposed to such a scenario. In particular, CLP and PEN’s export intensity in industrial metals makes them most at risk in the region. Among EM high yielders, MYR, ZAR and IDR seem therefore the most exposed to recent developments in China given considerations on export mix and reliance on Chinese domestic demand. While idiosyncratic considerations would suggest BRL ranks lower in terms of vulnerability, the renewed terms-of-trade shock, together with likely contagion from regional peers like CLP and PEN, suggests some spillovers are also likely. At the other end of the spectrum, INR and TRY seem to be the most insulated given low trade integration with China and their commodity importer status. 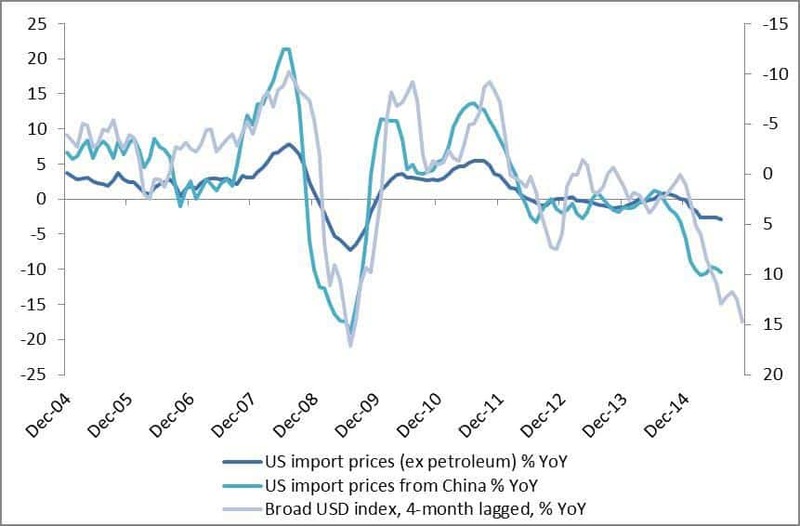 The Chinese short-term currency and economic outlook adds to global disinflationary pressures, including through lower commodity prices, in turn with potential implications for monetary policy and currencies in advanced economies. 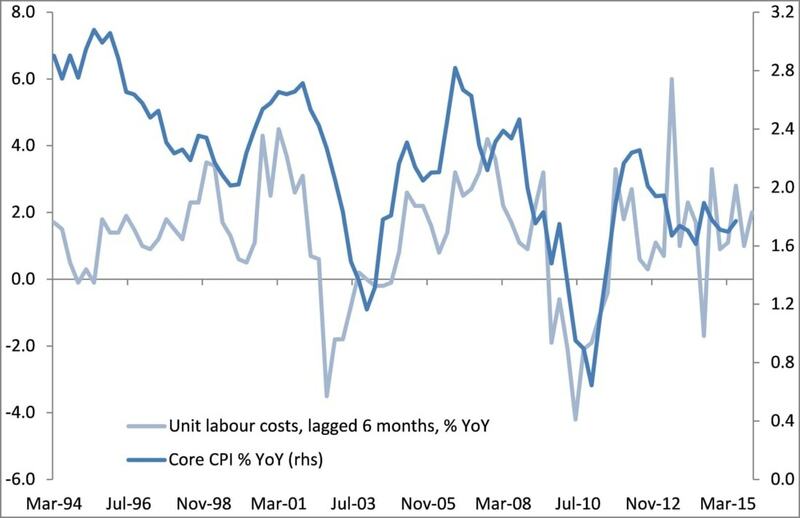 Our base case remains for the Fed to raise interest rates in September 2015 as the tightening in the labour market and strengthening in economic momentum outweigh the low inflation environment. With China making up about 20% of the trade-weighted effective exchange rate of the US, lower goods imported inflation from China will fuel some downward pressures on headline US inflation in our scenario of CNY’s gradual depreciation (see chart 11) but the focus for the Fed should be on core inflation trends, which we expect to slowly return to target, driven by a rise in unit labour costs (see chart 12). Key to this view is that US inflation expectations remain anchored amid a robust domestic economy. We believe that other central banks such as the ECB or the BoJ will be more significantly challenged as they seek to raise inflation expectations. Internal sources of inflation may not be strong enough to offset imported disinflation. For the EUR, this reinforces our bearish view on EUR/USD, as the ECB’s asset purchase programme is biased to be extended beyond September 2016 as inflation falls short of target and the ECB needs to maintain easy financial conditions. As for the BoJ, additional imported disinflation may eventually shift the central bank into action, in Q4 2015 or into early 2016. The BoJ has had an optimistic view on the inflation outlook, looking through the impact of energy prices, which has argued for no change in the BoJ stance in the near term. But this may change in our view if GDP fails to recover significantly in Q3 2015 after Q2’s contraction and as inflation falls. In this case, the BoJ may be under pressure to ease further monetary policy as soon as October 2015, which would create downside risks for JPY vs. USD in view of policy divergence with the Fed. Overall, although we do not look for the Fed’s interest rate outlook to be derailed, Chinese developments may exacerbate the low inflation environment and reinforce the dovish bias of a few central banks in advanced economies, including the BoJ and the ECB. Sources: Haver, Bloomberg. Data as of 17th August 2015. Sources: IIF, Bloomberg. Data as of 17th August 2015. 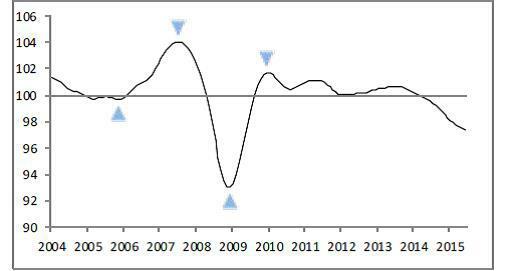 Chart 4: Growth losing momentum in China according to OECD composite leading indicator. Source: OECD. 10th August 2015. Sources: Bloomberg, Haver. Data as of 18th August 2015. Chart 6: Correlation of CNY with major EM currencies. Chart 7: KRW, TWD and MYR have high degree of trade similarity with China. Chart 8: Regional trade integration underscores vulnerability for TWD, MYR and KRW in particular. Source: Haver as of 20th August 2015. 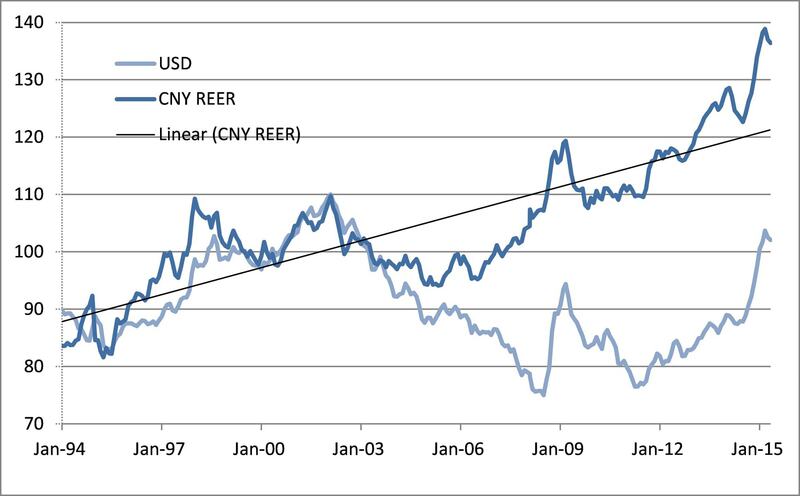 Chart 9: CNY weight in REER – Some EM commodity exporters like CLP, MYR or ZAR are particularly reliant on China. Source: BIS. Data as of 20th August 2015. Source: Haver. Data as of 19th August 2015. The information in this document is provided in good faith, for illustrative, information and educational purposes only. This document is for your private information only and is not intended for public distribution. This document contains the research outcome, views and opinions of Claire Dissaux and Mattia Taboga as August 20th, 2015 and does not necessarily represent the opinions of Millennium Global Investments Limited or the funds/accounts it manages or of any portfolio managers. Views and opinions expressed are Claire and Mattia’s views and opinions as of August 20th, 2015 only, and are subject to change without notice or issuance of a follow-up document. Millennium and its employees have no obligation to provide recipients hereof with updates or changes to the views and opinions contained in this document. Please note there can be no assurance that professionals currently employed by Millennium will continue to be employed by Millennium or that the past performance or success of any such professional is indicative of such professional’s future performance or success. This document does not constitute a personal recommendation or take into account the particular investment objectives, financial situations, or needs of individual funds or accounts, managers, principals or employees. This document is for investment professional use only and is not intended for public distribution. It is strictly confidential and is for your private information only. The document and the information contained herein do not constitute an offer to buy or a solicitation of an offer to sell and do not constitute an offer or solicitation in any jurisdiction in which such an offer or a solicitation is unlawful or to any person to whom it is unlawful. It is not intended to provide a basis on which to make an investment decision Information provided herein is supplied in good faith based on information which we believe, but do not guarantee, to be accurate or complete. The information contained in this document is not intended and should not be regarded as legal, tax or investment advice. You should consult your tax, legal, accounting or other advisors about the matters discussed herein. Distribution of this document or the information herein to any person other than the person to whom this document is originally delivered and to such person’s advisors is unauthorised and any reproduction or publication of this document, in whole or in part, or the disclosure of any of the contents, without the prior consent of Millennium in each such instance is prohibited. Portions of the information in this document may constitute forward-looking statements. Due to various uncertainties and events, the actual performance of the economy may differ materially from the risk factors and categorisations reflected or contemplated in this document. As a result, investors should not rely on these research findings in making any investment decisions. Certain accounting assumptions may have been made and some estimated values may have been used in compiling this report, and reasonable people may disagree with the assumptions used and expectations developed therefrom. Past performance should not be construed as a guarantee of future performance as the value of any investment may fall as well as rise, and an investor may lose all or a substantial amount of their investment. This document does not take into account individual investor circumstances, objectives or needs and is not intended as recommendations of particular strategies to particular investors. Any statistics with respect to the various indices are used for comparative purposes only and are not intended to suggest a correlation with Millennium’s products and services. Illustrations in the investment analysis models described herein do not necessarily represent any of the investments that will be offered by Millennium. Any illustrations and analyses are provided for discussion purposes only. This material is directed exclusively at persons who are experienced investors in unregulated collective investment schemes, and/or who are professional clients as defined by the Rules of the Financial Conduct Authority (“FCA”), or are otherwise eligible under these Rules. This document is not intended for private customers and such persons should not rely on this information contained herein. Moreover, any investment or service to which this document may relate will not be made available to such private customers. Millennium Global Investments Limited, is an English company, is authorized and regulated by the Financial Conduct Authority (“FCA”) and is also registered as an investment adviser with the Securities and Exchange Commission, and is defined as “Millennium” for purposes of these disclosures.